While this may be an older expression, the practice of “Keeping up with the Joneses,” is still very much applies to today’s culture. In fact, I’d go so far to say that we do this more today than ever before. If you’re unfamiliar with the term, “Keeping up with the Joneses,” is when someone focuses on their outward appearance and tries to appear well-off, often times as well-off as someone they might know personally. In today’s culture, social media, advertisements and celebrities are constantly posting and displaying lifestyles that we’re all trying to keep up with. So now we aren’t just trying to keep pace with our neighbor down the street, but with the whole world. Our society has done a good job of making us believe that this is the way to live no matter what it costs us. 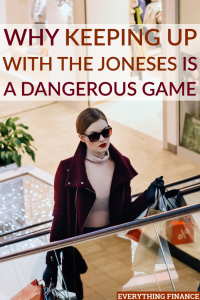 Unfortunately, “Keeping up with the Joneses,” is a dangerous and slippery slope that doesn’t usually lead to anything good. Here are some reasons you should stop trying to do just that. Celebrities and the uber-wealthy are quick to showcase their riches, and when you look at social media or television, it can begin to seem as if everyone but you can afford expensive things. In reality, the number of people who can actually afford designer clothes, diamonds, and private planes is really quite small, as in 1 percent. That being said, if you’re trying to keep up with a wealthier class, you’ll no doubt spend far more than you really have. Unfortunately, for many, keeping up with the Joneses means living well beyond their means and charging purchases to a credit card. Although this may seem harmless at first, your credit card bill can quickly become hard to keep up with, which is what lands so many Americans in credit card debt. Don’t let your desire to have what your neighbor does convince you to keep dragging yourself further and further into debt. Doing so could set you back years in terms of financial goals. Moreover, if you can’t afford to purchase something now, it’s unlikely you’ll be able to purchase it later, especially once you’ve racked up even more bills. Debt isn’t the only thing you might accrue in your quest to keep up appearances. Once you’ve started down a path of constantly keeping up socially with your money, it can be difficult to break from the cycle. And if that’s the case, you’d be surprised at the lengths you might go to in order to keep up the facade. In some cases, that could mean taking out loans to pay for houses or cars you really can’t afford. Like your debt, loan payments can get large and difficult to pay off, especially if you have multiple ones. All that being said, anytime you have multiple items to pay off, you’re likely not in a great financial situation. You’ll also find that living above your means could be detrimental to your savings as well. Unless your savings are stowed away in an out-of-reach, separate account, and even then, you might still gain access, chances are you just might be tempted to dip into your savings account. It’s no mystery that trying to keep up appearances can be addictive, which is why you’ll likely find yourself justifying purchases and using your savings account to buy them more and more. Furthermore, if you’re constantly spending, you won’t have much income, to put toward savings, retirement or any type of emergency fund. Life is unpredictable, which means it’s imperative that you’re ready for anything. Part of being prepared for the unexpected is ensuring you have adequate funds to fall back on. If you lose your job or get in an accident, having a full savings account can be the difference between getting through a crisis unharmed and going into crippling debt. Moreover, if you ever hope to one day retire and enjoy your later years, contributing to some sort of retirement fund is an absolute must. However, if you only spend, you might find yourself working for the rest of your life. While this may not be a factor that affects your finances, it can affect your health. You’ve no doubt heard the age-old phrase, “money doesn’t buy happiness,” and as cliché as it sounds, it’s true. To start, you’re never going to come to a point where you look around you and at whoever you’re keeping up with and say, “Ok, I did it, I’m done.” There’s always going to be someone or some trend you’re trying to equate to, the desire to acquire more and more will never go away. In your search for things and happiness from those things, you’ll find yourself exhausted and no happier than when you began, because contentment and joy don’t come from the things you can buy. You might feel pleased for a while, but that goes away, which means you’ll just keep trying to fill that hole. Furthermore, by keeping up with the Joneses, you’ll no doubt have to work more to accommodate a new life style, which only serves to burn you out. Not to mention the fact, that being exhausted at work and trying to stay afloat while in debt and financial turmoil will add an immense amount of stress to your life. Instead of finding yourself happy and as wealthy as the Joneses, you might find yourself depressed. This is the important thing to remember, no matter how someone’s life looks on the outside, you never truly know their situation. Just because the Joneses appear to have more doesn’t mean they really do or that they aren’t struggling to keep up with it as well. Don’t base the way you live your life or spend your money on your vision of someone else or society. In the end, you won’t be any happier and might just find yourself more in debt. Do you feel pressure to keep up with the Joneses or society? What are some ways to combat the desire to give into this type of pressure? Is it Smart to Pay for Your Funeral Before You Die?